On this page and the ones that follow, I provide information on four of the traditional, and most popular camino routes. The Camino Frances is one of the oldest roads, is the most well-marked, is very busy at peak season and has the best amenities for pilgrims of them all. New pilgrims are always advised to walk this path. If you're looking for something a little different, you do not have to follow the traditional routes to Santiago de Compostela. There are very many that were not so popular hundreds of years ago, but which people prefer to follow today. They are not as busy and if you do not like crowds, these walks to Santiago de Compostela may be just the thing for you. These alternative routes are often supported by the Spanish and French governments, though some may not have the full range of amenities present on the much older roads. In some cases, they may also present more of a physical challenge. Click on the link below to find more routes that might interest you. The busiest, most well-known pilgrimage route along the Camino de Santiago, the Camino Frances traditionally starts at the foot of the Pyrenees in the small village of St Jean Pied de Port in France and ends in the city of Santiago de Compostela, Spain. This is an easy route to follow because of the many yellow markers along the way. It is usually very busy between May and October, so first-time walkers, or those walking alone might prefer the Camino Frances for these reasons. 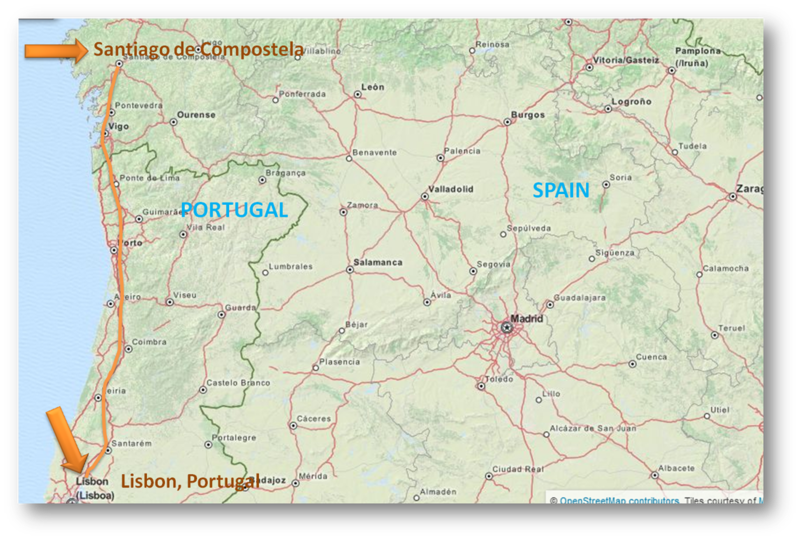 Click on the links for map, more info and for resources that will assist you in planning your walk along the Camino Frances. 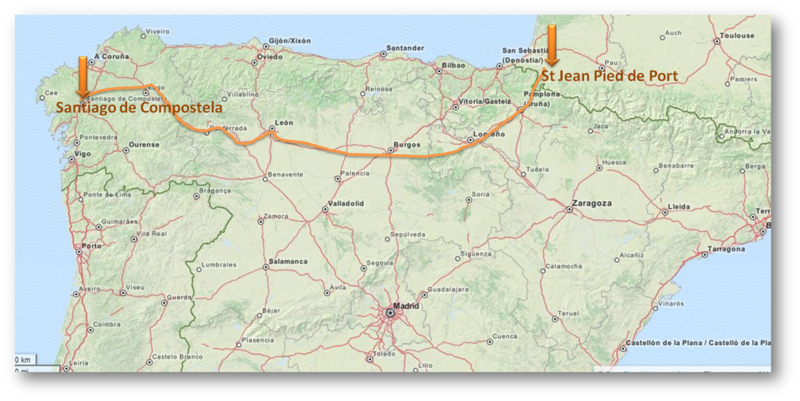 This journey is one that has a deep association with St. James the Apostle, and is the second most popular route after the Camino France. Having ministered on the Iberian peninsula, St. James spent a lot of time preaching along this route after the death of Christ. The Camino Portuguese begins in Lisbon and winds northwards through over 600 km of stunning rural countryside, across the border to Santiago de Compostela. The Way is marked and easier to follow these days than it was in the recent past. Press on the link below to read more detail about the towns that pilgrims pass through, distances between each of them, and much more. 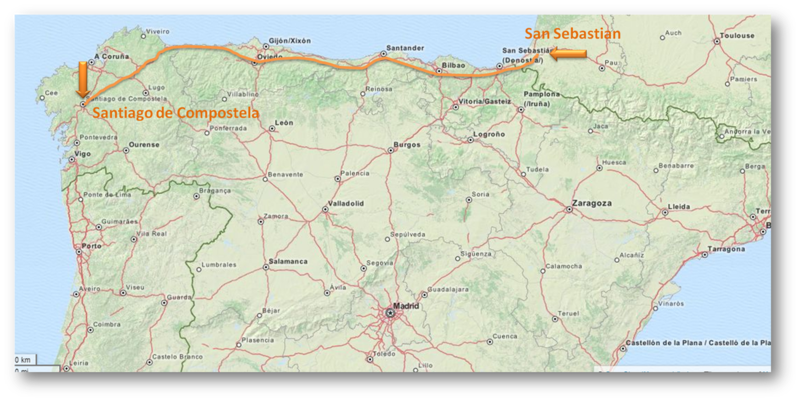 This is a tough coastal route, set along some rough terrain with many steep climbs and equally difficult descents and probably most suited to experienced hikers looking for a greater camino challenge. It is not well-marked in some areas, and pilgrims have to be very vigilant and well equipped with maps and food provisions (and, some advise, a tent). It starts at the French border in Irun, runs along the coast and turns inland to join up with the Camino Frances at Arzua. From there the pilgrim continues to Santiago de Compostela. It is about an 825 km walk. For more detailed information, press on the link below. The Via de la Plata is one of the longer routes and runs for about 1000 kms. Pilgrims usually start in Seville in the south of Spain and walk northwards to Santiago de Compostela after joining up with the Camino Frances at Astorga. Click on the links below for more a little more information about this route, and for an interactive route planner that will give you the distances between any two places en-route.